MegaRace 2 is a racing/fighting game (vehicular combat) developed by Cryo Interactive in 1996, released on August 31 of that year for the PC. 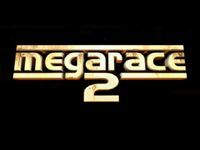 It was published by Mindscape and is the first sequel of the original MegaRace, which was later followed by MegaRace 3. This game also features host, Lance Boyle, played by Christian Erickson. In this installment of the futuristic racing series, you are once again the "enforcer" and you are once again attempting to win a series of races against computer opponents, by finishing in first place, or destroying their cars, automatically disqualifying them. Additions to this game are vast, especially concerning ways to destroy your opponents' vehicles, and ways they will destroy yours. Race tracks are more detailed and often more challenging. The cars are also now rendered in 3D. Microïds, owners of the Cryo brand, made the game available on Good Old Games in 2009. Source: Wikipedia, "MegaRace 2", available under the CC-BY-SA License.